During its eleven-year run, The Archdruid Report was one of the most controversial and widely cited blogs on the future of industrial society. 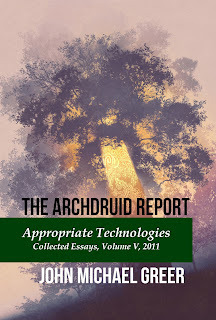 This fifth volume of the collected essays from The Archdruid Report covers the year 2011. The essays in this volume explore the appropriate technology movement of the 1960s and 1970s, and show how a constructive toolkit for facing the twilight of the industrial age can be assembled from the legacy of that movement and put to work to solve the problems of today.